Triangular pillows (also known as mon khwan or axe pillows) are an symbol of all things Thai and are found all over Thailand from the backpacker bars of Koh Tao to the palaces of Bangkok. But as soon as you start looking to buy them, they suddenly seem to be something of a rarity. Triangular pillows are readily available at the Chatuchak market but unfortunately the market operates at weekends only, so it is easy to miss. Another great place to buy triangular cushions are at MBK, a large shopping centre in the Siam region of Bangkok. MBK is open from 10am to 10pm 7 days a week. The easiest way to get to it is by getting the BTS Sky Train to National Station. MBK is well signposted from the station which is connected using a skywalk or bridge. There are also a number of busses that stop right next to MBK and virtually every taxi and tuk tuk driver will know where it is. Alternatively you can take the MRT (underground) to Samyan station and walk up Prayathai Road. The walk takes about 10 – 15 minutes and gives a pleasant view of one of Bangkok’s most impressive universities. When you get to MBK, head to the 5th and 6th floor (Thai crafts). These are usually the floors with the best selections and prices. 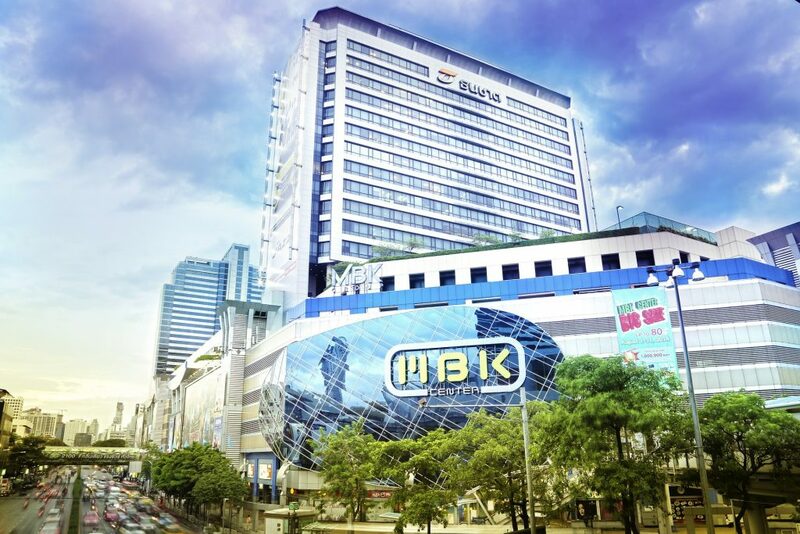 The MBK shopping centre in Bangkok. HOW MUCH ARE TRIANGULAR AXE PILLOWS IN THAILAND? As with everything in Bangkok, how much you pay for an axe cushion will depend on how well you can barter. A stuffed triangular cushion usually sells for about 1500 bhat (about £30 or $45) but can be purchased for as little as 1000 bhat (around £20 or $30). An unstuffed triangular pillow can be bought for as little as 500 bhat (around £10 or $15). The key to getting a good bargain is to shop around and barter. Don’t be afraid to walk away if a shopkeeper won’t come down to your price as the majority of the good bargains I got from Thailand were made after I started to walk away. Both MBK and the Chatuchak market have a large number of stalls, so don’t feel forced into buying at the first one that stocks triangular cushions. SHOULD I BUY A STUFFED OR UNSTUFFED AXE PILLOW? Thailand’s axe cushions are traditionally stuffed with Kapok, a fibre derived from a plant. Many countries including the United Kingdom, most of Europe, the United States and Austrailia have laws against bringing plant mater and seeds through customs. Although many people manage to bring stuffed triangluar cushions home without any problems, there are countless cases of tourists getting their’s confiscated on returning back to their home countries. The other issue to take into consideration is the sheer size of a stuffed triangular cushion. Unlike other pillows and cushions, it is hard to compress them into a small space. The easier option seems to be buying an unstuffed axe cushion. These take up far less space in your suitcase or backpack, won’t get you in trouble with overzealous custom officials and can easily be stuffed on return to your home country. WHAT SHOULD I STUFF MY TRIANGULAR PILLOW WITH? Very few western countries have a widely available supply of Kapok to stuff your triangular pillow with, but there are plenty of alternatives. The key is getting a firm material that will give you plenty of support. Some use beans that are readily available for beanbags. Others use high grade foam fillings (these need to be stiff as average foam won’t give the support needed). One of the best suggestions I have come across is to use old clothes and rags. These can be cut into small strips and stuffed throughout the triangular cushion. This is the method we used with ours and seems to give the closest result to Kapok. How Safe Is Venezuela for Tourists?